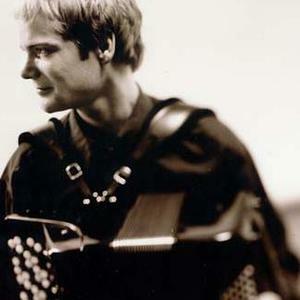 Frode Haltli, born 1975, is a Norwegian accordion player. Haltli started to play the accordion at the age of seven and over the following few years he won several national competitions and scholarships. He was awarded first prize in Norwegian TV's Talentiaden 1991. He studied the accordion at the Norwegian State Academy of Music from 1994 and at the Royal Danish Conservatory of Music where he ended his studies in 2000. Haltli started to play the accordion at the age of seven and over the following few years he won several national competitions and scholarships. He was awarded first prize in Norwegian TV's Talentiaden 1991. He studied the accordion at the Norwegian State Academy of Music from 1994 and at the Royal Danish Conservatory of Music where he ended his studies in 2000. He was awarded the Young Soloist of the Year prize 2001 by the Norwegian Concert Institute at the Bergen International Festival 2000, as well as second prize in the prestigious International Gaudeamus Interpreters Competition in the Netherlands. His debut album Looking on Darkness (ECM Records) received a Spellemannprisen (A Norwegian Grammy) for the best contemporary music album. He has also received the French Prix Gus Viseur, in 2004 for the same album. Frode currently (2006) lives in Oslo but frequently tours abroad, in Europe, Russia, America and Asia. He has performed as a soloist with major orchestras and is actively working with chamber music?the trio Poing taking up much of his time currently. The trio, with Rolf-Erik Nystr?m on the saxophone and H?kon Thelin on the double bass, mainly performs contemporary music. He also often plays with Trygve Seim (with whom he will record their first duo CD for ECM in November 2006) as well as the Norwegian folk group Rusk, with singer Unni L?vlid and fiddler Vegar V?rdal.